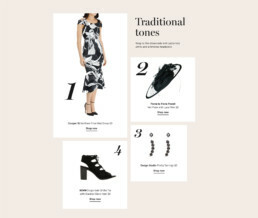 The Myer Spring Racing catalogue comes out once a year for Melbourne Cup Day, and features product tailored specifically to the fashions which the event is famous for. Women’s looks are broken down across Cup Day, Derby Day, Oaks Day and Stakes Day, each with its own specific feel. 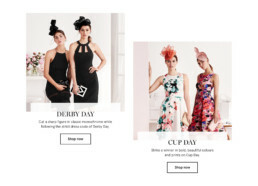 The content includes hints on how to combine product purchased on the Myer website to form the race-ready looks, as well as practical tips for making the most of your time at the Races. 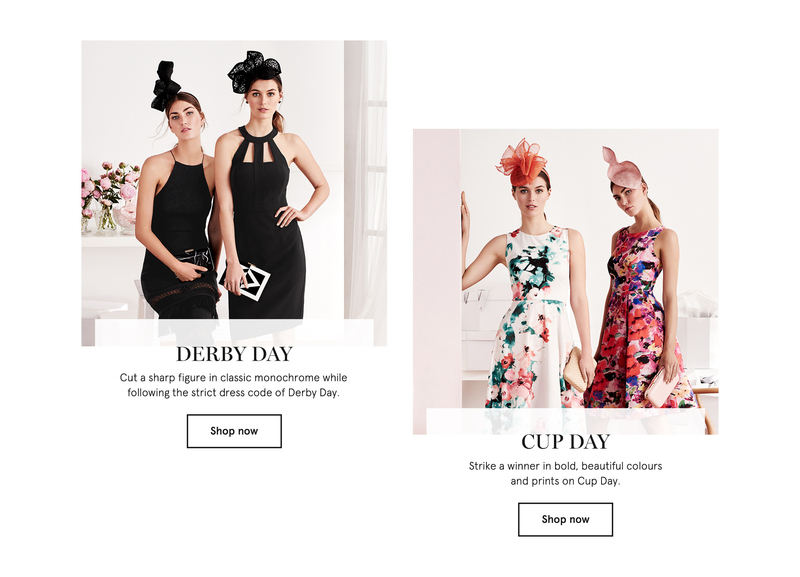 I collaborated with another digital creative to design the Women’s Spring Racing Hub, which led off to pages dedicated to each of the four days, as well as a separate hub featuring men’s fashions. 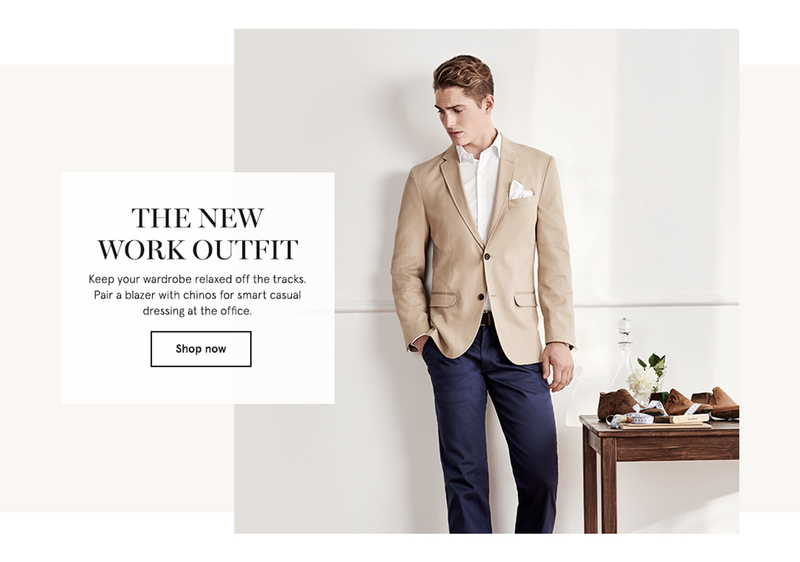 Both the Women's and the Men's web hubs included a shoppable video, shot on location with talent dressed in a selection of items available to shop on the site. 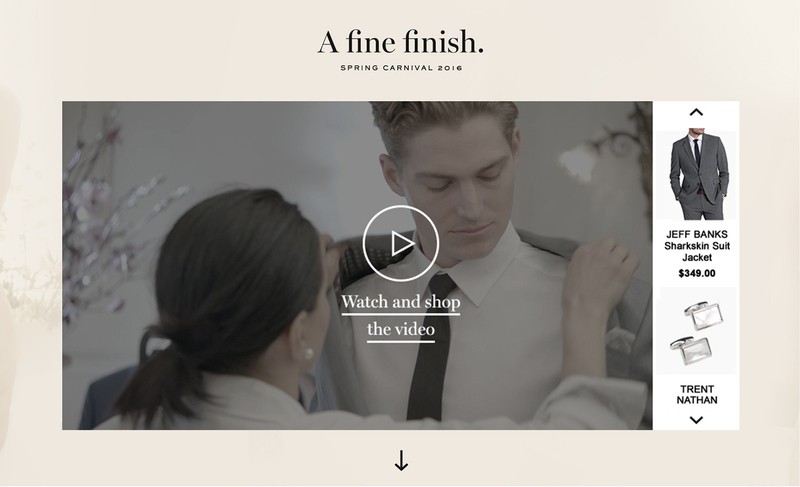 A slider appeared on the right of the video as an overlay, with scrolling product timed to correspond to the items worn by the talent in the video, linking directly through to the online shop. Each of the four days was featured on the Women's Spring Racing Hub - these tiles led visitors off to each of the pages dedicated to the days - for example, Derby Day. Product related to the Spring Racing hub was listed on the page, leading visitors straight to a special edit of the online shop, featuring all other Spring Racing related products. Featured shop edits were created specifically for Spring Racing, including plus size and designer collections. 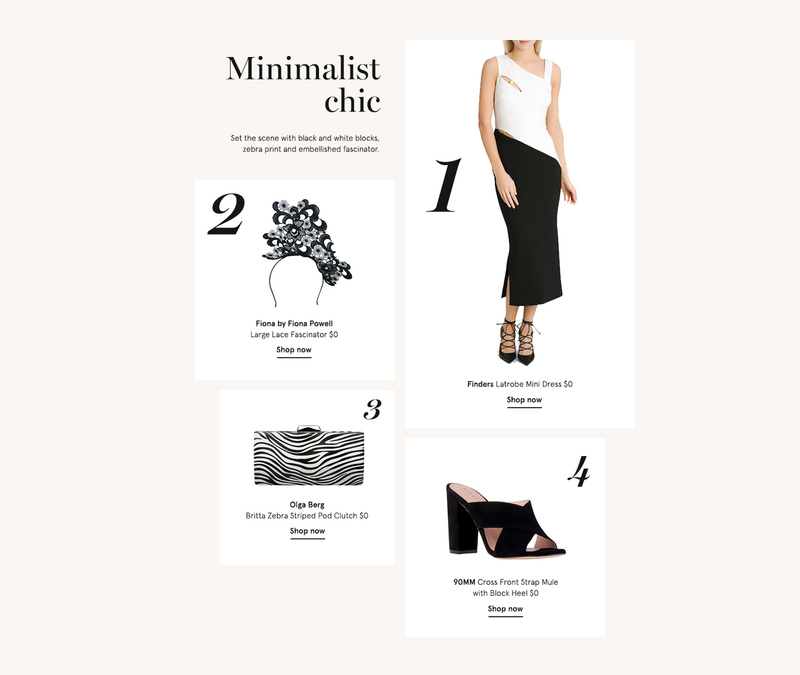 Each tile clicked through to its respective shop edit, which displayed the entire shoppable collection with 2-click add-to-cart functionality. The Derby Day look is strictly black and white. 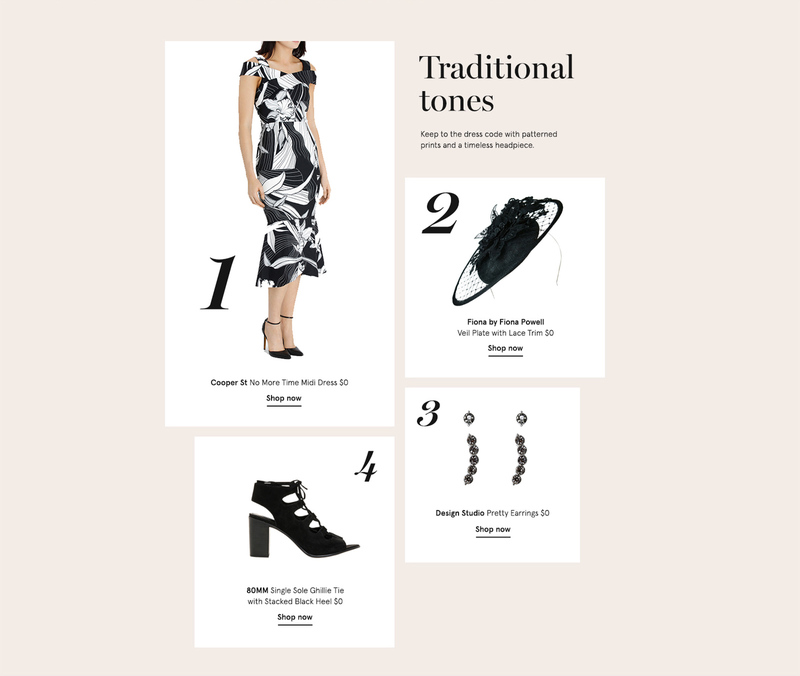 The Derby Day page featured suggestions for how to combine dresses and accessories, across 3 separate variations on the look, each item also including a direct link to the shop. 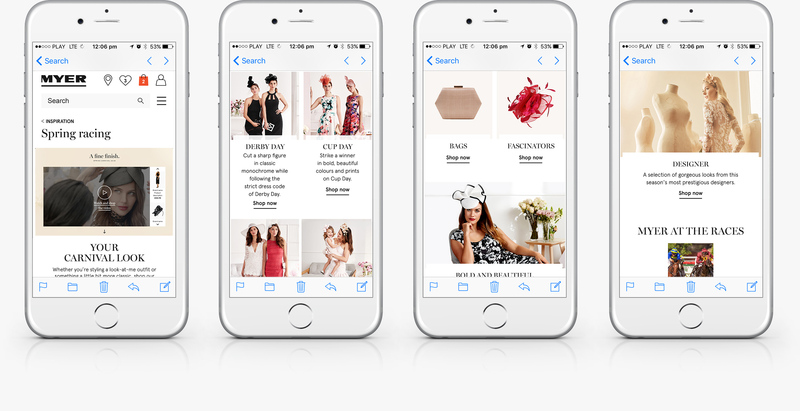 We wanted all visitors to have full access to the fashion, the tips, and the shopping from any location. 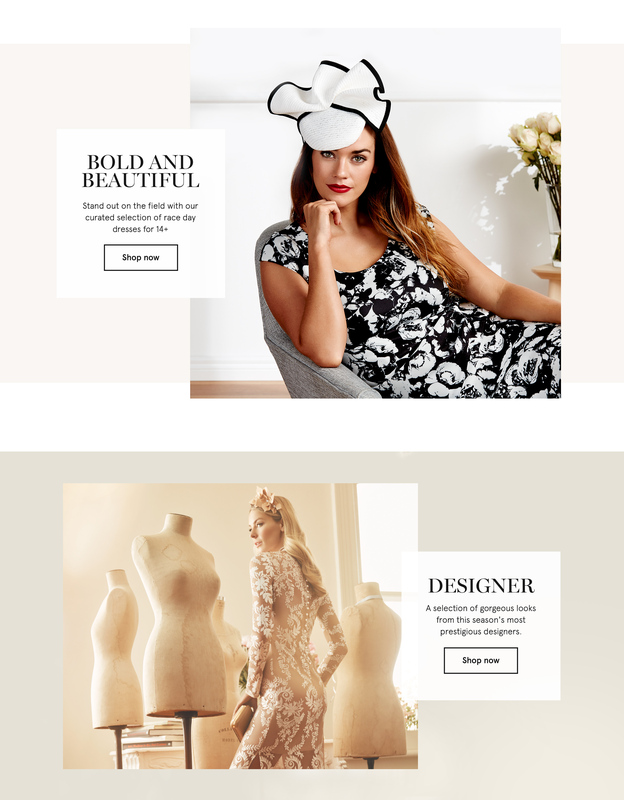 Both the Women's and the Men's hubs were constructed on a standard 12-column responsive grid; minimal creative copy and a modular approach to the design made the task of translating mobile to desktop easier. The immense skill of our developers allowed us to add interest to the design, including responsive transparent textbox overlays and alternating alignment within content modules. 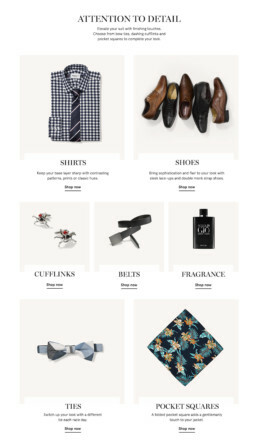 The Men’s Spring Racing Hub was a mirror of the Women’s Hub, featuring Race Day fashions for Men, and including a shoppable video which sent visitors off to shop for specific items such as cufflinks and pocket squares. In the same way as the Women’s Hub, product related to the Spring Racing hub was listed on the Men’s Hub – visitors could shop the Spring Racing edit of the men’s shop by clicking on the product links on this page. 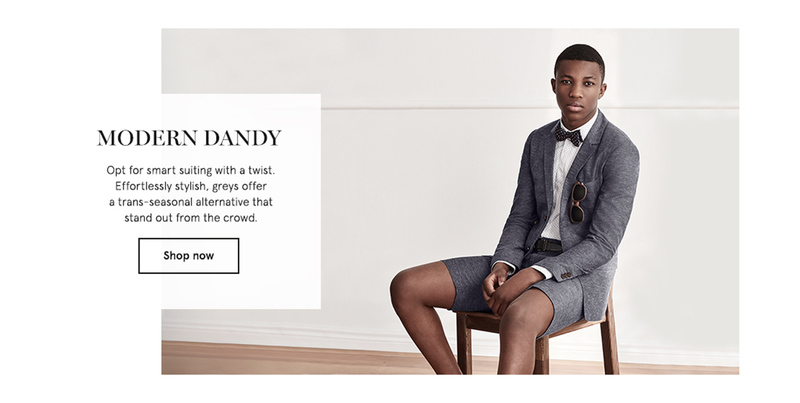 Instead of splitting looks out across the four different race days, as per the Women's Hub, the Men's Hub featured looks such as The Modern Dandy. The Hub also offered more pragmatic work-ready outfit options for men.